I'm fortunate enough to have a chance to build a JKU and my plan is to put together a vehicle that will fit my needs perfectly. I have a few attributes that will outline what I'm focusing on with the final product, all modifications will be done with these ideas in mind. 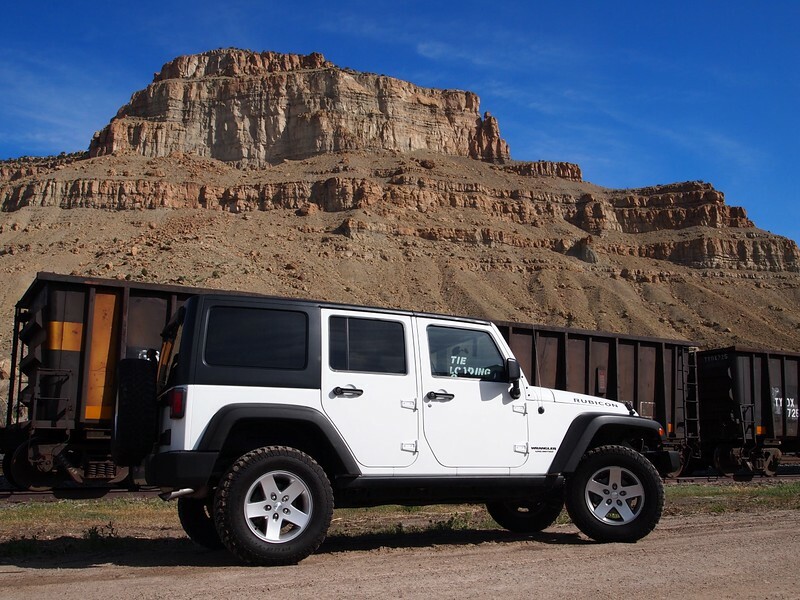 For those that don't know me, I run a Utah-based 4x4 forum (RME4x4.com) and will also be using the JKU to promote my forum. 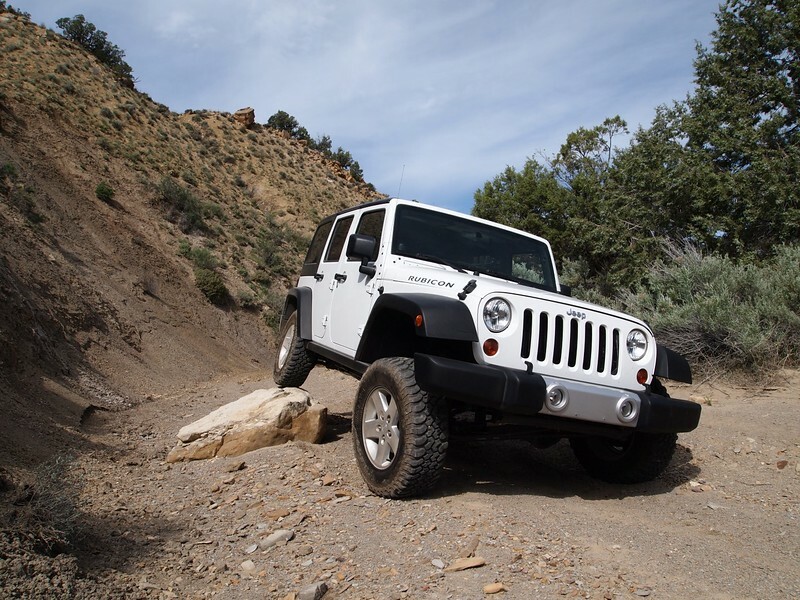 Factory Reliability, for minimal issues when traveling far into the back country. Freeway Friendly, comfortable and drivable for those long roadtrips to reach new places. 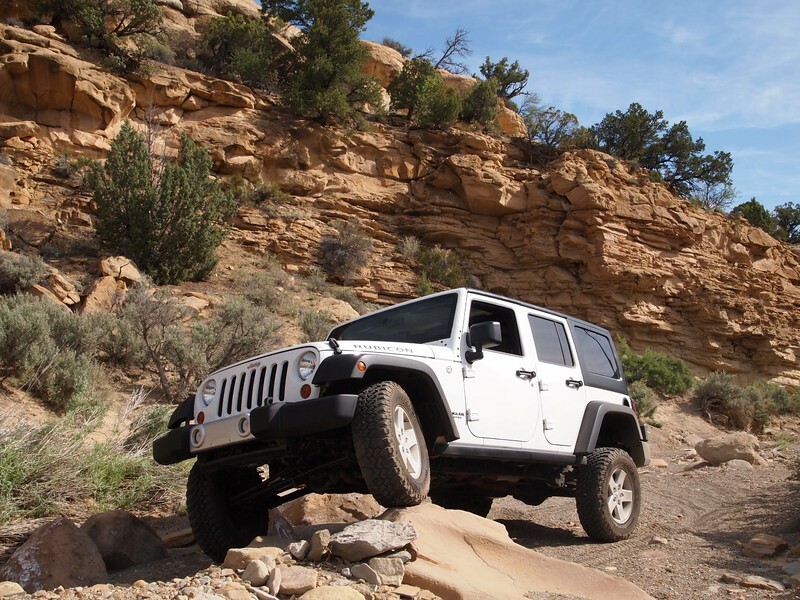 Excellent Suspension, capable of carrying us and our gear while running long distances over rough trails. Highly Capable for those very difficult trail situations. Simple, Clean and Quality mods that serve a purpose. Most of my trips are usually local day or weekend trips... the San Juan mountains of Colorado, the amazing Red Rock deserts of Utah and sometimes beyond... like week-long adventures exploring the dirt tracks and remote offroad trails of Baja, Mexico. I'll be building this JKU to take me to those places in comfort and with the knowledge that this Jeep will make it thru without issue. It won't be a 'rock crawler' by any means, but living so close to Moab it will probably spend some time on the trails in the area. 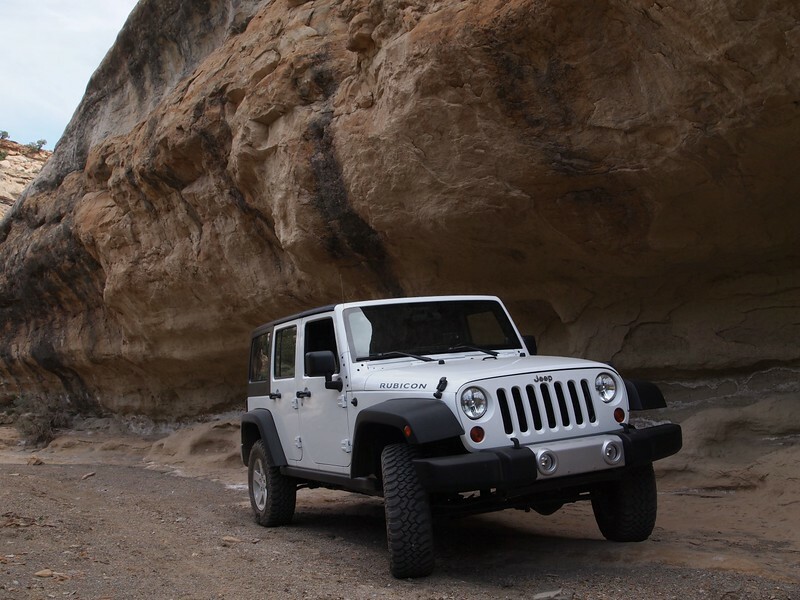 I'm starting with a 2012 Jeep JKU Rubicon with an automatic trans, hardtop, 38k miles and a few mods from the first owner, which include a 2.5" TeraFlex Budget Boost lift using stock springs and shocks. Of course being a Rubicon it had front & rear diff locks, a 4 to 1 transfer case, 4.10 ring & pinion gears and an electric disconnect anti-sway bar. It's a pretty good base to build from! 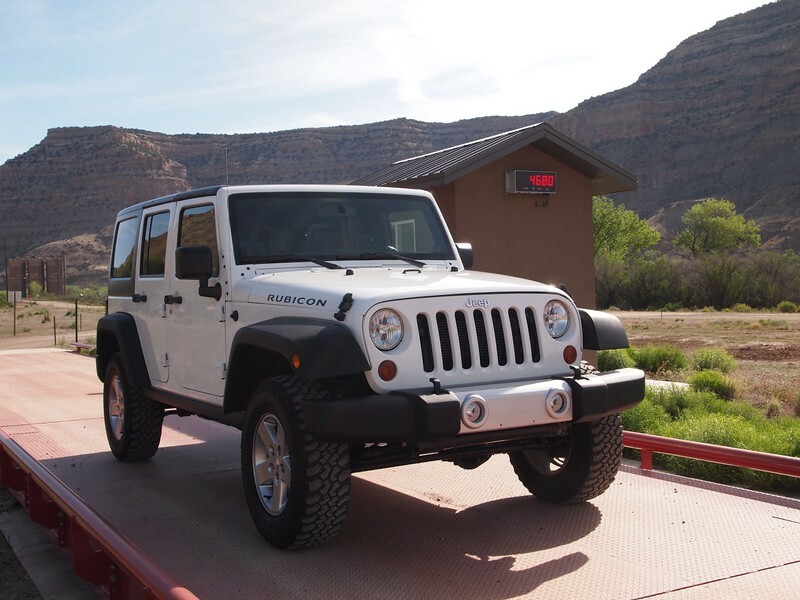 I bought it from a dealer in SLC who bought it at auction and after doing my research, came to find out that since new this was actually a rental Jeep at Canyonlands Jeep Rental in Moab! Now any sane person would probably walk away, but I was interested... I'm a sucker for a project. I know how I'd drive a rental Jeep and knowing it was used (and abused) in Moab for the first 37k miles of it's life was pretty unnerving. Moab trails can be brutal on vehicles, let alone someone who doesn't own it or care for it like a personal vehicle. A good friend stopped by to check it out and we noted that the undercarrige and skid plates were all scraped up and dented... even the crossmembers are pretty beat up. On top of that, both lower control arms are BENT on the passenger side! :Wow1: This Jeep looks most other Jeeps would look like after 150k miles with weekend offroad use. There is no doubt that it has been used often offroad. After talking about the condition, history and needs of the Jeep we settled on a fair price and I went into it knowing that it was going to need a good deal of work getting it in top shape again. In my mind, it's going to need all new suspension, steering, ball joints, etc, etc. I wouldn't doubt that even the front axle is no longer perfectly straight, so there may be an upgraded front axle housing in the future. TeraFlex Outback Suspension System which provides a 3" lift heights, heavy rate springs, TeraFlex Speed bumps, limiting straps, etc. I'm a big believer in supporting the local businesses and people in the local 4WD community and am going to do my best to keep my purchases local. Shortly after finalizing the purchase of the Jeep (at Riverton Chevy) we drove over to see our friends at Teraflex. Joe was working and gave us a great tour of their new location in West Jordan... it's impressive! Lots of space for their massive inventory, show room area, shipping and manufacturing departments. If you haven't seen their new location, you ought to check it out! We meet up with Vinny and along with Joe's help we talked about what my needs were from the Jeep and they put together a great suspension option for us based on our needs. We added a few other neat products and a couple of TeraFlex bumpers and carefully loaded it all into the back of the Jeep! I wanted to get a baseline with the Jeep 'stock' and see how it worked offroad. I headed out to a local canyon with a truck scale nearby and took some pics. First thing I did was weight the JKU as is... I did have a CO2 tank and a bag full of recovery gear, but it looks like it's sitting at 4,680 pounds. Next up was an offroad test in Cameo, up Coal Canyon. The JKU actually works very well cruising down a dirt road at speed, the linked coil suspension seems pretty supple in the mild roads... until you bottom it out! It hits hard! I was actually pretty impressed with the ride quality that the stock mid-length control arms of the JKU provide. I dropped into the rocky canyon bottom, dropped it into 4 Low and started playing in the rocks. I have to say, the electric sway-bar disconnect is pretty damn nice... push a button and go! Then I had to play with the lockers and big rocks... again, the wheel travel and performance of a 'stock' JKU is pretty amazing! I wasn't even aired down and it was capable enough to go anywhere I wanted. I had to get a few poser shots and called it good... very happy with the performance of the Rubicon! Factory bumpers are gone and the new TeraFlex bumpers are in place! They looks great, I think they'll be a valuable improvement in strength, offer stronger recovery points, a winch mount and better approach & departure angles. I'm going to hold off on the winch, see if my rusty, old Warn XD9000 will sell so I can put a new Zeon 8 on. Also ran into a herd of Big Horn Sheep while I was driving thru the Colorado National Monument. It was amazing how easily they scaled the rock cliffs! Nice buy! Assuming you factored into the price all that needs to be done, this is a great opportunity to build it the way you want at a reasonable all in cost. I would imagine the mechanicals are all in good shape as it was probably well maintained. I'm looking forward to following your progress. Yes, I wouldn't have bought it without knowing what kind of money I needed to put into it. I hit the dealer pretty hard and in the end, they sold it at their cost... several thousand under NADA and their sticker price. It's coming along quick, once the suspension is done there will be the little things that really round out to make a great vehicle. 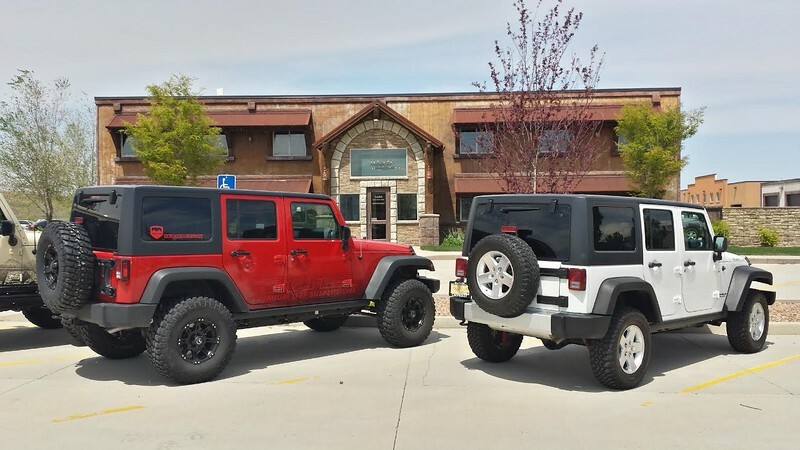 Yeah, stopping by TeraFlex was kind of like a one stop shop for building a JKU! It's been a LONG day, but the front end is 90% together! The TeraFlex Monster HD Forged Front Adjustable Trackbar... it's name is well deserved, it's about 3x the weight of the factory part! That should help keep death wobble away and allow for a good deal of tuning to work with the new 3" lift. Speaking of lift, the Outback Suspension springs are seriously beefy, seems like they'll be a great upgrade for a JK that's set up to carry a heavy load.. they're obviously much larger and thicker than the stock springs. REALLY digging the limiting straps that were included, they'll save the shocks from getting destroyed when the suspension gets too light. After getting everything set up, I'm impressed with how much up & down travel the JUKR will have, the guys at TeraFlex have done their homework and put together a killer option for an engineered suspension system. Shortly after buttoning up the suspension install, my wheels arrived from Quadratec. I decided on the Rubicon Xtreme in Black, they're 17" wheels with 4.75" BS and 9" wide... I like how they look like a factory wheel, but a bit wider and better backspacing... and the $150 price seemed very fair. I loaded the wheels up and headed down to the local Discount Tire for a set of 35x12.5x17 BFGoodrich KO2 AT's. I'm very happy with the combo, looks great and the tires roll very smooth on the road. Next up was to install the TeraFlex Heavy Duty Hinged Tire Carrier. The carrier itself is made from cast aluminum and you'd think that sounds pretty light... but it's far from that. It's very well built with strength in all the right places. I was curious about the weight so loaded it on the scale... looks like the carrier itself weighs 23#'s! This thing is BEEFY! The removal of the stock carrier and install of the TeraFlex HD Tire Carrier was pretty straight forward. I also added their Accessory Mount for my RotoPax 2 gallon tank and CB antenna. Since the JKU now had a great suspension and larger tires, I decided it was time for a real test and probably the most difficult challenge it'll see. 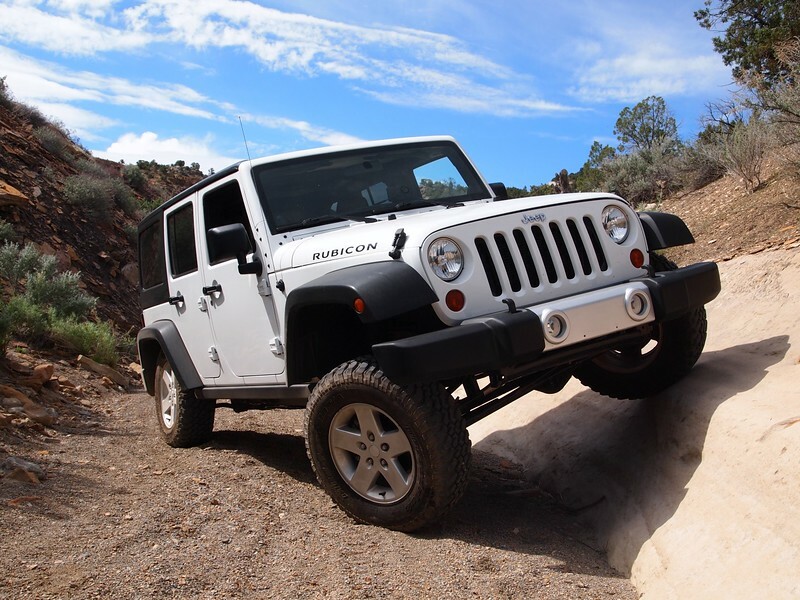 We live 90 min from Moab, so we loaded up for a daytrip to run the Rubicon thru it's paces. I aired down to 15 PSI and we hit the dirt. We first headed to Dome Plateau and ran the part of the trail... I wanted to take it easy and see how it worked, then test out the suspension on the fast dirt roads. Next up we headed over to Hells Revenge and even ran the optional Hells Gate! After playing on Hells Revenge we headed over to the Moab Rim. It's been years since I've been up the Rim and my wife never has... the JKU walked right up everything! Sent using a squirrel raised from birth by a flock of well trained carrier pigeons. Thanks for sharing your review here! Thanks! Hopefully many more great pics coming up in the future. No problem, thanks for building great Jeep products! It's been a little while since I had any time to work on the JKU, but I finally had a chance to get some very needed upgrades done! My next step was improving lighting, most everyone knows the factory Wrangler's lights are lacking in a big way. I decided on a pair of heated Truck-Lite LED headlights and Rigid Dually D2's in place of the fog lights. I got my lights from John Williams at Impulse Off Road, he knows his Jeeps very well and has been building them for a long time. John was great to work with, I gave him the part numbers I wanted and he got them on the way for a good price. I added a yellow lens cover to my Dually D2's, but after testing them with and without the yellow cover, I decided to leave them off. It was pretty easy to install the headlights, the Dually's took more effort as I had to remove the bumper and solder in the new light plugs. Some before and after pics, taken in the same location and same time of night. The new LED headlights are a good improvement over the stock lights, but the Dually D2's really brighten up the road and fill in the dark parts. I'm hoping that with these upgrades I won't need any additional lighting for offroad use, don't need any more objects blocking the grill and radiator. Once all that was done, I could now install and wire up the Warn Zeon 8! I added the Master Pull synthetic rope and fairlead after removing the stock steel cable. It's been a few weeks since the last update and there has been some additions! Since we have been in the heat of mid-Summer, I was feeling the need to do something about the heat soaking in thru the black hardtop. The A/C works well, but the amount of heat that you feel on the inside of the top is crazy! It was time for some HotHead Headliners. I added the side window liners, their 'Sound Assassin' deadener and choose the Dark Oak color, which is a close match to the color of the interior. The difference is impressive, much less heat coming in thru the top and reduced noise as well. It would be nice if JK's came with this from the factory! Next up was the TeraFlex MP multi-purpose tailgate table w/ cutting board. Install was quick and easy, less than 30 min. Using the nutserts was simple, I tried to take my time and be careful and it helped. I installed the tailgate table right before a camping trip in the JKU and was very happy to have it. Today I spent the morning installing the TeraFlex JKU rock sliders. This was a delicate operation, you need to drill 20 holes in the Jeep and add 14 nutserts. It's a bit unnerving drilling 20 holes and adding the nutserts, but again taking my time and being patient really helped... even thought it was 95*s outside! I watched the TeraFlex install video and that really helped in addition to the instructions. I used a liberal amount of anti-sieze on the nutsert install tool and threads of the nutserts and had zero issues. Collapsing the nutserts was done with hand tools, I felt I had more control and feeling of where the nutsert was 'set' with hand tools. Taking my time, the work took a few hours. I also decided to install a pair of Husky mud flaps on the front. I'll probably get some ribbing for these and never would have put something like this on my Jeep before, but the amount of mud, rocks and dirt that gets throw all over the side of the JK bothers me. The hinges get pitted and my windows have scratches in them already due to being rolled down with dirt on the outside. I don't know how long the front mud flaps will stay on after a trip to Moab, but I wanted to try them out. I think with the TeraFlex sliders and Husky mud flaps, I'll keep a good deal of dirt off the side of the Jeep. Last but not least, I added some 2" wide 3M grip tape, for sure footing when standing on the slider. Thanks! It's coming together quick, but there are still some big things in the works!